2016 electoral map projections from a wide range of sources. Select any of the links for the latest map and detail. All the maps are interactive, so you can use any of them as a starting point to create and share your own forecast. We’ve included thumbnails of some of the maps below. This was the final projection for the 2016 election from Larry Sabato and the team at the University of Virginia Center for Politics. Use this map as a starting point to create and share your own 2020 presidential election forecast. The Associated Press analysis of the electoral map as of November 7th. 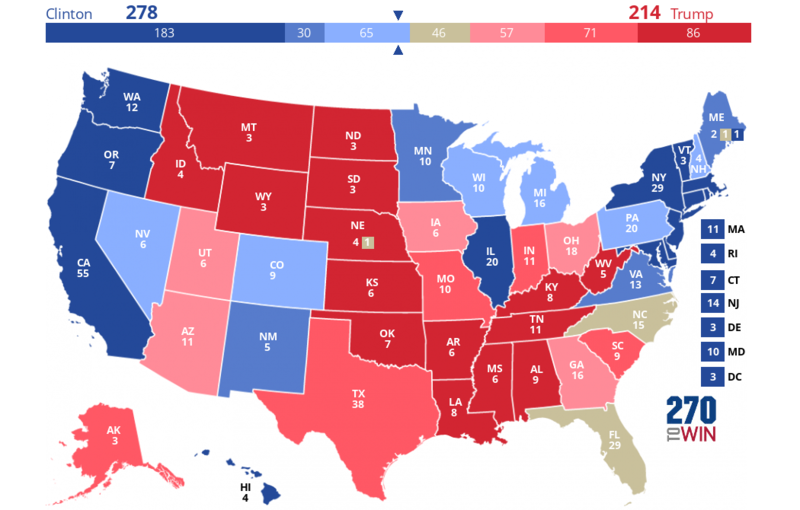 Updated hourly, this is an electoral map derived from the polls-plus forecast from FiveThirtyEight. This is defined as "what polls, the economy and historical data tell us about Nov. 8." The ratings below reflect the final update before the 2016 election. Use it as a starting point to create and share your own 2020 presidential election forecast. From CNN: There are very few things that the Donald Trump and Hillary Clinton campaigns agree on these days, but one point of total agreement is that this race has tightened over the last 10-14 days." 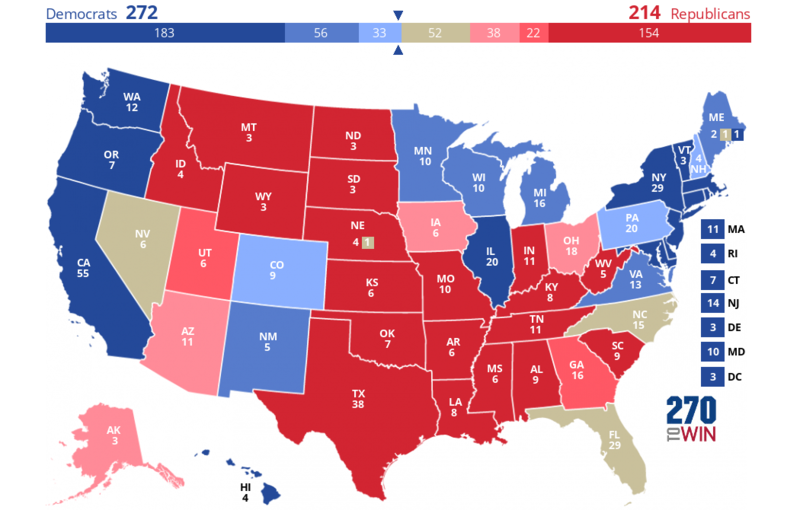 This was the final projection for the 2016 election from Cook Political Report. 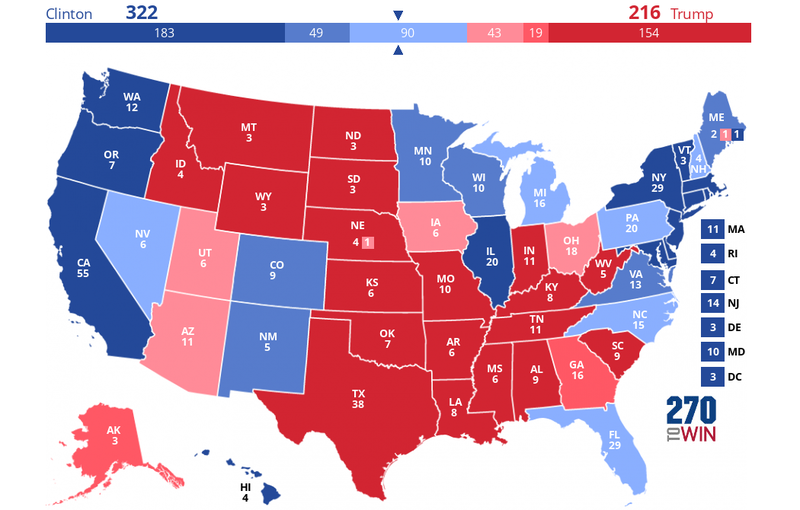 Use this as a starting point to create and share your own 2020 presidential election forecast. To learn more or to subscribe, visit The Cook Political Report. Final projection* for the 2016 election from Rothenberg & Gonzales Political Report. Use this as a starting point to create and share your own 2016 election forecast. To learn more or to subscribe, visit The Rothenberg & Gonzales Political Report. From the NBC News Political Unit: "In our final battleground map of the 2016 presidential race, Hillary Clinton holds a substantial lead over Donald Trump". "Clinton has 274 electoral votes in her column (which) is more than the 270 needed to win the presidency." From NPR: "Election Day is nearly upon us. 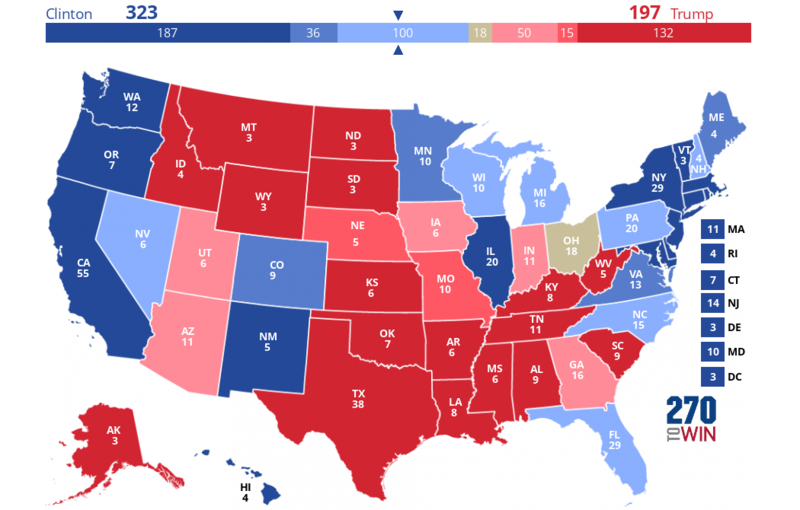 So where does the electoral map stand? It's a close race, with Hillary Clinton retaining a broad and consistent but shallow advantage, according to the final NPR Battleground Map." The final electoral college ratings map from "The Fix" political team at The Washington Post. Use this as a starting point to create and share your own 2016 election forecast. Follow @TheFix on Twitter for their latest commentary and analysis of the 2016 elections. 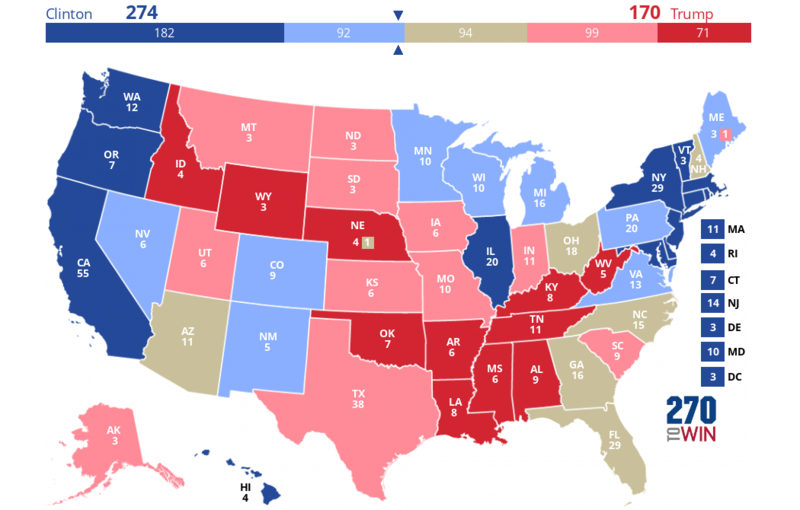 Final 2016 projection from Louis Jacobson, who has handicapped the electoral college in 2008, 2012 and 2016, most recently for Governing magazine, where he writes a twice-monthly column on state politics. Jacobson is also a senior correspondent with PolitiFact and senior author of the Almanac of American Politics 2016. This analysis also ranks states from most likely to go Republican to most likely to go Democratic. Full report. 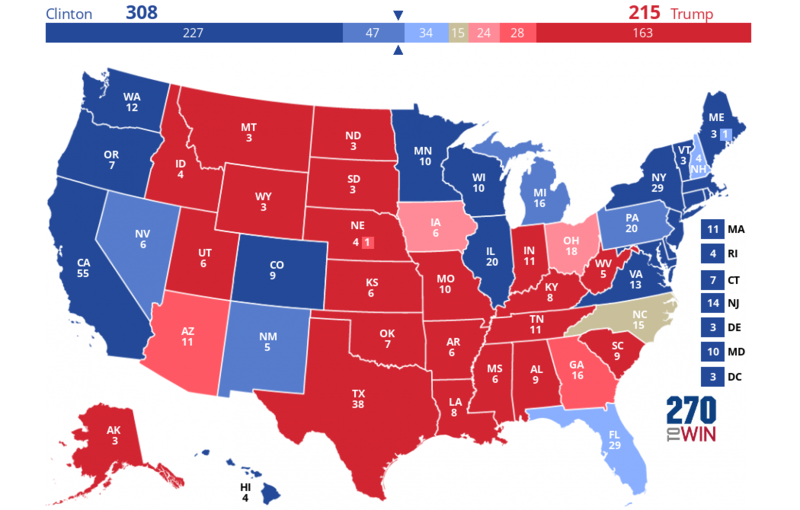 ABC News electoral map ratings updated November 4th.